This species is similar to the very polymorphic species T. heterophylla. Typical specimens have only a single leaflet but some have three leaflets. However the petioles are 4-5 cm long rather than 6-10 cm and they are not pale yellow, nor is the midrib. 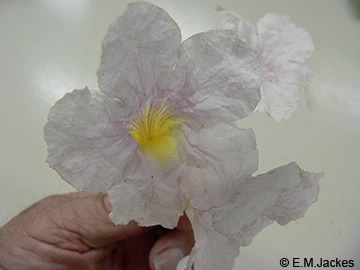 Flowers are white to pale mauve with a pale yellowish throat. Capsules to 17 cm long and about 1 cm wide, dark lepidote scales are obvious on green fruits. Overall this is a much larger tree than T. heterophylla when they are grown under similar conditions.